It’s almost here! Monday night, September 24th is the official celebration of Family Day – A Day to Eat Dinner with Your ChildrenTM! It’s wonderful that so many of you already eat dinner together, and this day is a day to talk with your kids about the reasons you do! But some of you find it more challenging that rewarding! I completely get it. The challenge changes from toddlers whining to your teenagers not being there at all, but there are a few things you can do to help your kids want to participate at any age. Make sure everyone can be there! While this isn’t always possible, having as many people from your family present is always more fun! Serve food you know your kids love! It doesn’t’ always have to be roast and potatoes for dinner, have waffles, scrambled eggs, or homemade pizza. Have a conversation jar! Corny? Yes! But my kids like this so much, that they have literally made their own. Have a theme! Whether your theme is being whisked off to a foreign country, or simply RED NIGHT, having a theme will bring laughter to the table, and possible education! Make it simple. A five course meal doesn’t’ exactly appeal to toddlers. Keep it simple, thereby keeping it fun. Play “restaurant”. Print a real live menu and order your food from your kids! Let them plate it and serve it to you, or vice versa. Take the night off from nagging. Don’t worry if your kids don’t clean their plate, or take 3 bites of their veggies. For one night, look the other way, let it go. Relax a little. Have a Dinner bar: Potato bar, pasta bar, oatmeal bar, salad bar, crepe bar, or any type of bar allows kids to have a little more control over their choices, within the realms of your meal. Have a progressive meal. Starting with appetizers on the front porch, move to the main dish at the dining table, followed by dessert on a field of grass with a picnic blanket. Whatever you decide to do, do it together and enjoy dinner time. Don’t dread it! 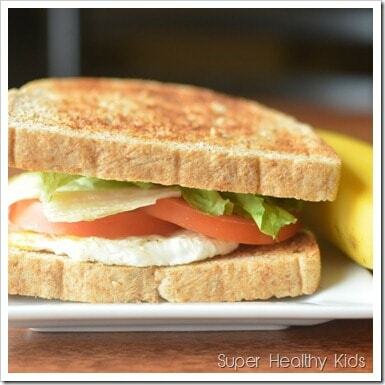 Monday breakfast: ELT: Egg, Lettuce, and Tomato Sandwich! Just printed off your meal plan. We are stuck in a rut and sometimes I make meals too complicated. All of these are super simple, easy, and well-balanced. Thank you!